"3LA1, V-1986" by Timothy K. Perttula and Robert Z. Selden Jr. CONTEXT INFORMATION: Found in Burial 2, Burial Plot 1, in association with V-1984 and V-1985 (Martin 1939). DECORATION: The upper rim panel has a single horizontal engraved line under the lip that also has a row of engraved tick marks; there is a second engraved-ticked line at the junction of the upper and lower rim panels. The lower rim panel has four appliqued nodes with an engraved and ticked semi-circle around the node. Between each node and engraved semi-circle are six or seven regularly-spaced vertical to near vertical engraved lines. A white kaolin clay pigment had been rubbed in the engraved-ticked lines. Belcher Engraved, var. 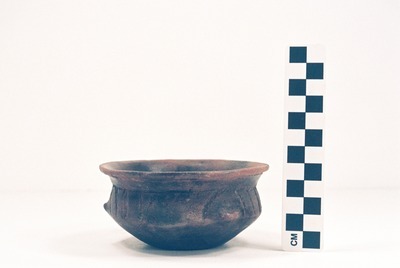 Belcher carinated bowl (5425-722).